45 years ago a tradition was started at a theme park in Buena Park, CA called Knott’s Berry Farm that would change Halloween forever throughout the theme park industry worldwide. On the weekend of Halloween in 1973, Knott’s Berry Farm was transformed into Knott’s Scary Farm’s Halloween Haunt. Complete with monsters roaming the streets of Ghost Town and a show in the old John Wayne Theater hosted by Seymour, the 1st year of Scary Farm was a huge success. 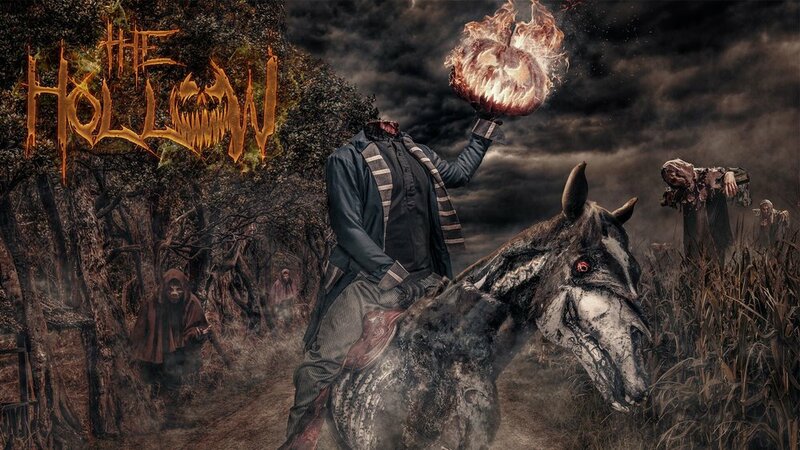 Knott's Scary Farm is no longer just a one weekend event. On Thursday September 21, 2017, the gates of Knott’s Scary Farm opened for another terrifying year, but this year there are 25 nights, 9 mazes, 4 scare zones and 2 shows. Below you will find our review on each maze, scare zone and show from opening night. This will be our honest opinion of each and we will try and include photos from the event. Due to an increased opening night crowd, Hatbox Photography did not take as many photos as usual inside of mazes out of respect to the guests around us. We did not want to disrupt their enjoyment of the event. We apologize in advance for this if you were expecting an onslaught of photos. Photos will be added throughout the Halloween season so be sure to check back later. Hope you enjoy the review. Please feel free to leave comments, ask questions, give feedback. We'd love to hear from you. Dark Ride takes over the Boardwalk Ballroom where Dead of Winter was housed the last two years. While Dead of Winter never really took off at the Farm, mostly due to lack of budget, it was still a fun maze while it lasted. Dark Ride though has arrived as one of the most anticipated mazes in many years. Given the budget to work with, Dark Ride delivers in every way. An absolute must at Scary Farm this year, Dark Ride takes you into an old abandoned carnival, dark ride that has been taken over by rats, monkeys and terrifying clowns. The detail in this maze is incredible. Starting with the flooring where you can see the old track that the ride vehicles would move along throughout your journey. You also get to see some backstage areas of this dark ride that no guests had seen before. The finale room is huge and very entertaining. The talent working this maze were full of energy and really brought it both times we went through. I do have to say that the 2nd time through the maze the talent was fairly sparse (due to breaks), but the talent that was in there had just as much energy towards the end of the night as they had at the very beginning. Congratulations to Jon Cooke and his team for another outstanding maze. Do not miss this maze this year if you attend Knott’s Scary Farm. *Update: 3 weeks into the 2017 Halloween season and this maze is still on fire. The talent has been killing it night after night regardless of the time of night. There are moments when the maze feels a little empty due to breaks and lunches but you get this with all mazes. It is highly recommended to get to this maze early in the evening as the line can be 2 hours long on busy nights. We finally have a maze again at the entrance of CS. This area that once housed the long running, fan favorite Slaughterhouse maze has been quiet over the last 3 years due to the Infected queue taking up space in 2014 & 2015, then the area just not being used in 2016. This year, Pumpkin Eater, designed by the twisted mind of Daniel Miller, takes over the area and most likely has a home for the next several years. Another fantastically detailed maze with a creepy soundtrack, a wonderful cast of characters, a gooey pumpkin room and a tribute to the old Cornstalkers maze, this is a must see at this year’s Scary Farm. When waiting in line there is a talking pumpkin scarecrow reciting the Peter Peter Pumpkin Eater rhyme and a couple of really cool fairy tale looking buildings on either side. The energy of the talent inside was high the first time we went through but had died down significantly later on in the evening. Being the first night, some of the talent will need to learn how to control their energy from start to finish so they don’t burn themselves out every night. Overall, loved this maze. Can’t wait to see how the talent evolves throughout the 2017 season. *Update: Pumpkin Eater has become our favorite maze of the 2017 season. The talent is finding their groove and the layout and detail of this maze is excellent. The giant pumpkin puppet with the crazy green lights is crazy cool. We didn't notice this the first weekend but it is one of our favorite moments in this maze. The line moves pretty quickly so it's not essential to get to this right away, but it is a definite must before you leave for the night. Trick or Treat has been a fan favorite for many years at Scary Farm. For us personally, it had gotten quite stale the last few years. Even with the changes that were made to the end of the maze a couple of years ago, the story just got old. The maze was always highly detailed and looked pretty, it just didn’t excite us like some of the other mazes did. So when they announced they were bringing Trick or Treat back for another season, but this time with the lights out and we were going to be handed flashlights, we finally had some excitement for this maze again. Did it deliver? Yes and no. Was it unique, fun and amazing? Absolutely. This new twist definitely revitalized the maze and brought new life to it. I can now see this maze lasting another few years which would probably make it the longest running maze of all time if it does. The characters are now creepier than before which is a major plus. The new ending, which was needed for sure, is also a positive new addition to this maze. The only downside, beside the low capacity, is the fact that the flashlights didn’t act as we had original been told they would. During the Knott’s presentation at Midsummer Scream and then again at the passholder preview, excitement grew when there was talk of the flashlights suddenly going completely dark, only to turn back on a few seconds later with a monster staring you in the face. This was one of the biggest selling points of this maze and we have to say that our flashlights didn’t turn off once. Nor did they dim and they only changed color once in one room. Now, had the flashlight experience not been as hyped as it was, this would have been our favorite maze of the night. But since we didn’t get exactly what we were expecting, there was a little bit of a letdown. But overall, this is still a must and we highly recommend coming to this maze first due to the low capacity and the line moving a little slower than most. *Update. We attended Knott's Scary Farm the following night and the flashlights were working more as expected. Hopefully it was just opening night kinks and the way the flashlights were working on Friday night is more of what we are going to get the rest of the run. If so, this could be the best maze of the season. ** 2nd Update: The flashlights are working the same as they were the 2nd night still which is a plus from opening night. However the low capacity and long lines for this maze make it almost impossible to see unless you get to this right after rope drop or if you attend the pre-scare buffet. Still not sold on this maze sticking around after this year, but we are pretty sure due to the budget spent on the new overlay, Trick or Treat will be around for a few more seasons. This year's overlay of the Timber Mountain Log Ride, Halloween Hootenanny is a family friendly experience that day guests can experience as well. It is nice to see Knott's use this ride for the Scary Farm again. There are some jump scares throughout the mountain but they definitely don't attempt to be super scary or creepy. The music is fun, the detail is about as good as a log ride Halloween overlay has been. The wait time on opening night was probably 20-30 minutes for standby which we believe is worth it if you have time. This isn't a must see if you have to choose between Halloween Hootenanny and say Trick or Treat or Dark Ride. But if you are doing well on time and you can fit it in, it is definitely a fun trip through the mountain. *Update: We have not done Timber Mountain Log Ride again so there is no real update other than the line for this is starting to get really long on busy nights. If you must do this, go early. We were unable to do this on opening night so our review is for Friday night September 22nd. Special Ops: Infected is in it's 4th year and the 2nd year at this location. It was a great decision to move Infected to Mystery Lodge to free up the Camp Snoopy area to all guests. This year there was supposed to be more zombies than ever before and interactive targets you could shoot that were supposed to do something, but after waiting about 45 minutes in line before we finally got in at 2:05am, all we found was a zombie here and there and interactive targets that were anything but interactive. The wait time earlier in the evening was 2-3 hours. This is still a very popular attraction but a 2-3 hour wait in our opinion just would not be worth it. You would not be able to do everything in an evening unless you had a Fright Lane pass. Infected is still very detailed and still a lot of fun, but it's nothing new and nothing we haven't seen before in years past at Knott's. If you just love shooting zombies and being in a live video game, then we suggest you head to Infected first right after rope drop or do the pre-scare buffet to get a 30 minute head start on the general public and knock out Infected before heading to Trick or Treat or Dark Ride. But if you did it last year and thought it was fun but wasn't the best thing at Knott's last year, then this year is no different and we would suggest doing everything else first, then heading to Infected at the very end of the night. *Update: The line for Infected has consistently been 2-3 hours long night after night. Even the Fright Lane was an hour and a half long on the 2nd weekend. While this maze is fun, it does not warrant a 2-3 hour wait time. And having an hour and a half wait for front of the line is ridiculous. People pay a lot of extra money so they don't have to wait very long in line and you're going to make them wait an hour and a half. Something needs to change to get the line moving quicker. Capacity is just way too low for this maze. Taking the place of Pinocchio Unstrung, Red Barn debuted in the Wilderness Dance Hall in 2016. It was a fairly simple design that was put together in a rather short amount of time, but it worked and worked well. The one thing really missing from this maze in 2016 was a chainsaw at the end. Now we are not huge fans of chainsaws. Certain Halloween events go crazy with chainsaws, but Red Barn would have been one of those times that a chainsaw would have worked perfectly at the end. In 2017, there were multiple changes made to this maze that only enhanced it for the better. It almost felt like a brand new maze. Taking the best parts of last year’s edition and adding new pieces has made Red Barn a do not miss attraction. The talent was fun and energetic. Not really creepy but this type of setting doesn’t really make us uneasy or creeped out. Now, we don’t know if the person was on break, but when we walked through there was no chainsaw going at the end as had been hinted at the passholder preview. There was a chainsaw sitting on the table which we are assuming is the one that would have been used, but there was no one there to use it. We are looking forward to going through this maze again another night to see if there is actually a working chainsaw at the end. Overall this is another great maze at Scary Farm that has changes which have only enhanced the experience for guests. Do not miss Red Barn this year. *Update: Red Barn has kind of gone down hill as the season goes on. On opening night this maze was a lot of fun with a log of energy. That energy seems to be dying as the weeks go by. Major props however to the guy in the beginning of the maze with the microphone up above and the guy in the wheelchair about 2/3 of the way through the maze. Both have done an amazing job all season long. The guys with the chainsaws at the end need to have a bit more energy instead of just waving the chainsaw in your face as you walk by. Shadow Lands debuted last year in 2016 to rave reviews. Another highly detailed Jon Cooke maze that lived up to the hype, Shadow Lands began its 2nd year just as strong as it ended its first year. The beginning is slightly different than last year as well as a section in the middle of the maze, however most of the rest of the maze has remained the same except for some lighting differences. The soundtrack is still great. We only got to do this maze once on opening night which was pretty early in the evening and a lot of talent was still getting their makeup done. In fact as we were leaving the maze several characters were walking to the maze. So while inside, the rooms felt fairly empty but the talent that was there for the most part was bringing it hard. We think this maze will be here for several more years as long as the talent stays energized and little tweaks here and there continue to be made. This is another strong year for Shadow Lands and is a must see for sure and with its close proximity to Dark Ride, you should be able to knock both mazes out fairly quickly if done early enough in the evening. Update: Not much of an update for this maze. It's still fun and the energy for the most part is still pretty good. If you enjoyed it last year, you'll still enjoy it this year. Back for it’s 3rd year, Paranormal Inc. just keeps going strong. One of if not the most detailed maze at Knott’s Scary Farm, Paranormal Inc. is still a creepy fun time. When this maze debuted in 2015 it was an instant hit with fans. The story, which started in the queue while you waited, was very cool, the detail was on point and the talent inside killed it each and every night. Last year was another strong year for this maze and really had no decline in talent from the previous year. This year on opening night, while the maze is still looking great and is still one of the best mazes Knott’s has ever done, the talent seemed to be missing something. There wasn’t much energy at all when we went through and in the first room where the show occurs, there seemed to be a little confusion from the talent on how to funnel people out of that room and into the actual maze portion. We are quite certain this was just first night jitters and this will all change as talent starts to get in their groove and find how to best use their character and surrounding décor to their advantage. One thing we were not too thrilled about was the lighting on the façade. In the past this maze had a blue tinted light shining on the façade but this year it is a bright white light that doesn’t fit the mood of the maze as well as the blue light did. It’s something small and not that big of a deal, but sometimes lighting does a lot, especially for a façade. Overall this is another strong year from Paranormal Inc. and we highly recommend this maze as well. Looking forward to seeing this maze later in the run when the talent is peaking. *Update: The following night the talent was on fire. Without a doubt the best energy of the night. Super impressed with their work on Friday. The lighting on the façade seemed to have been adjusted as well. It still wasn't the same blue tinted light as in previous years but it wasn't a bright white light like on opening night. It is a much softer light that really lights the façade nicely. **2nd Update: The talent has dropped off a bit from that 2nd night when they were the best of the evening. This is still fun. The line hasn't been as long as the past two years which is a good thing. One thing I would like to see next year if it returns is to ditch the preshow. This is year 3 now and everyone knows the story behind it. The preshow makes this another low capacity maze and although the lines haven't been as long this year, it still does move slow most nights. You can still have 2 paths to choose from, but next year forget about the preshow and just let guests into the maze. Back for another terrifying year is Toothfairy. Long time designer Daniel Miller created one of the most disturbing mazes of all time a few years back when Toothfairy debuted. No one loves going to the dentist but a trip through Toothfairy makes you never want to see a dentist’s office again. This is one of those mazes that due to its content could be around for a few more years and still work. And 2017 is definitely still strong and still has lots of life. It’s as creepy and terrifying as ever. There wasn’t much talent in the maze when we went through but the ones that were there were trying hard. Some succeeded, others will really need to find their groove this first weekend so they are prepared for the busier weeks ahead. Not much has changed except for the ending which is pretty cool however we were not blown away by the new tooth fairy at the end. We do think the new toothfairy is better than the animatronic they’ve used the last few years that was broken most of the time. Overall another strong year for Toothfairy but if you’re running out of time and have to choose between this and one of the newer mazes, we’d say head for one of the newer mazes. But if you have time to squeeze it in, go for it. You will not be disappointed. *Update: The line for this maze is usually fairly short except for on really busy nights. The talent is doing pretty good but the energy has started to fall off a bit as some of the talent starts to hit the midseason wall. This is still a fun maze but I can see something taking its place next year. One of the mazes we thought was going to be replaced this year, Voodoo keeps plugging along. This year, the maze runs in reverse so you enter where the exit used to be and you exit where the entrance used to be. We have to say it was weird not seeing a queue setup in front of the maze. We were not crazy about Voodoo returning as we felt it had definitely run its course but we figured with the new layout it might be pretty cool. We were wrong. The new layout did nothing for us. It felt like the exact same maze just going in a different direction. The talent didn’t seem to bring anything new either. There were some bright spots but overall there wasn’t much energy in this maze. The final room was really cool though and the best addition to this maze in a few years. It was a big surprise for sure. We would not put this high up on the list of must see mazes but if you’ve already done everything and there isn’t much of a line, go for it. If you are running out of time go ahead and skip this maze. Now we have heard from other people that the new direction of Voodoo really made this maze feel fresh and certainly everyone's view is going to be different. We personally did not feel the new flow made any difference at all. We would not be disappointed if this maze is replaced with a brand new maze in 2018. *Update: No real change from our initial review. This maze is still just old to us. Reversing the path has done nothing to excite us. And one complaint, a couple of weeks ago as we were going through the last room, a blackout was standing in the middle of the walkway making you go around them before you exited. The whole point of a blackout is to not be seen. You stand in the corner and observe and step in when needed. You are not supposed to be in the middle of the path forcing guests to go around you. What else can we say about Ghost Town. The scare zone that started it all 45 years ago is still the strongest and best scare zone of any theme park Halloween event we've ever attended. The unique personalities and cast of characters that Ghost Town has roaming it's streets is one of the things that makes this zone so great. The setting is another aspect that makes this zone stand out above the rest. Fog alley can be intimidating for new visitors or to those that are afraid of the unknown. What is lurking in the dark under the cover of fog? You'll have to venture down this alley to find out. Then there's the area out in front of the Birdcage Theater. One of the busiest spots of Ghost Town, this has become a very popular spot for guests to sit and watch the talented team of monsters scare. A team of characters that includes a snake, a nun, a rooster, a witch and a bride, just to name a few. If you love scares and getting spooked, there is no better place to visit than Ghost Town at Knott's Scary Farm. This year's crew is just as strong as ever and a trip or two through Ghost Town is an absolute must for everyone. If you have the chance, the opening ceremony in Ghost Town is amazing. You have to be fairly close to the rope to actually see it, but if you do, you will get chills. Being led by the bride, the monsters emerge from the fog with the Johnny Cash song Ain't No Grave playing over the speakers. It is definitely a sight to see. It's the best opening ceremony Knott's has had maybe ever. The Hollow debuted in 2016 and was an instant hit with those that took a trip through CS. There wasn't much to pull guests into the Hollow so it probably didn't get the foot traffic it deserved. It also lacked decorations. This year there's a maze at the entrance to the Hollow (Pumpkin Eater), lots of decorations in CS and plenty of talent roaming around this fairly large scare zone. There are 3 witches, scarecrows and other creepy characters to see, all of which bring plenty of energy and scares to this very cool scare zone. We can see this zone being around for quite some time. There is also a secret inside the Hollow that we cannot disclose here. You'll have to take a trip through CS and see if you are one of the lucky ones that get told the secret. Not everyone knows and it's not listed on any map so if you are selected, you will get to experience something pretty cool and unique. We highly recommend taking a trip or two through the Hollow during your visit to Knott's Scary Farm. One of our favorite scare zones year in and year out, 2016 saw a decline in energy, creativity and scares that we were used to from Carnevil. It was a bit disappointing. 2017 seems to have turned things around. On opening night there were clowns everywhere using fun and unique ways to scare guests. This is the largest scare zone at Knott's Scary Farm and sometimes can feel a bit empty in certain areas. We did not get this feeling at all on opening night. The clowns are back with a vengeance this year and the fact that Dark Ride ties into the area makes it that much cooler. The only downside to this year's edition of Carnevil is the construction going on where Boomerang used to be. The walls they have built up around that area makes for a very tight walkway across from Coast Rider. We can see this being a huge bottleneck on very busy nights. Also because of the construction walls, there is no place for Knott's to hang those colored lights above the area which used to really tie into the whole carnival feel. Now it's just a dark walkway which really takes away from the atmosphere. This is not the fault of the talent obviously and I am sure they will make the most out of what they have in that area. All in all this looks to be another strong year for Carnevil. If you have a genuine fear of clowns, I would highly recommend staying out of Carnevil if you can because they are everywhere and they will do everything they can to terrorize you and leave you with nightmares you will not soon recover from. Can't wait to see how this team evolves even further as the season goes on. Fiesta De Los Muertos has always seemed to be missing something in our opinion. It has tremendous potential but just seems to fall flat year after year. There are some really great characters who really work hard night after night. The matador is one of our favorites. The costumes and makeups are great. But sometimes the energy just isn't there and some of the scare tactics used are not really effective. 2017 so far seems to be a mixed bag again. One major positive is the DJ is gone. This means this scare zone will not become a big dance party every night. It will be much quieter and feel more like a true scare zone. We believe one of the reasons this zone has struggled in the past is it never truly felt like an actual scare zone. The DJ being gone should really help this zone in 2017. Having said that, while walking through Fiesta on opening night, there were a few characters that had the chance to really make a great first impression on us and the way they approached their scare was very lackluster and lazy. It was early in the evening and we were probably one of the first guests they came across this season and they acted as if they had no desire to even attempt to scare us at all. This was not a great way to start the run in our opinion. Hopefully that is not an indication to their approach this year. When we were in Fiesta later in the evening though, the majority of the talent that we saw was working very hard and getting some really good scares. Hopefully their hard work will rub off on those that were not giving 100% earlier in the night. Overall it is too early to tell if Fiesta will realize it's true potential this year. If what we saw later in the evening is an indication as to how this zone is going to work, then we have high hopes for Fiesta and feel like it can be a great place to visit on a trip to Knott's Scary Farm. A big thank you goes out to the talent that was working hard trying to put their stamp on Fiesta de los Muertos and on Knott's Scary Farm itself. We will have an updated review later in October. Elvira Mistress of the Dark. The Queen of Halloween is making her 5th consecutive appearance at Knott's Scary Farm. When the announcement was made 5 years ago that Elvira was making her return to Knott's after 12 years away, there was excitement, joy and a question as to how long Elvira would be performing. That question was answered at this year's Midsummer Scream when Cassandra Peterson made an appearance and announced that Knott's Scary Farm's 45th anniversary would mark the final year Cassandra would perform as Elvira. The Queen of Halloween is retiring at age 66 after this year's event, but she still looks amazing. This year's show has some major throwback old school moments. It's a typical Elvira show full of dance numbers, comedy, singing and has a brief appearance by the macabre mobile, twirling tassels and Elvira's famous red couch. This show is fantastic and a great way for the Mistress of the Dark to close out her performing career. This is a must see especially if you love Elvira. You do not want to miss her final performances of her illustrious career. The dancers do a very good job although we are still partial to the Academy of Villains. In fact the 2014 show that featured the AOV, Brett Loudermilk and Bendable Bonnie is still our favorite show overall of Elvira's since she returned, but this show isn't far behind that one and this is definitely the most of Elvira you have seen in the 5 years she's been back, and we mean that in more ways than one. She is on stage for almost the entire performance either singing, dancing, or telling jokes. She even tells a little story on how Mistress of the Dark came to be. It's a pretty funny moment in the show. There are only two performances a night, one at 9:00pm and one at 11:30pm so make sure you schedule your night around one of those times. You will not be disappointed. Much love to Cassandra Peterson and her long amazing career as Elvira. We have never been a fan of the comedic hanging. We are not up to date on our pop culture and to us, we go to Knott's Scary Farm for the creep factor not to watch a comedy show, other than Elvira, but the hanging is certainly no Elvira. But with everything happening in America this year and with the title of the show, we figured hey it can't be that bad this year. It couldn't be any worse than last year. So we watched. And we have nothing to say other than, it's not good. Now this is not a knock on the hardworking team that does 3 shows a night 4 nights a week. They do an amazing job with what they are given. Unfortunately they are not given much. A half hour show that produces maybe 3 laugh out loud moments. And as for who they hang this year, we didn't even have a clue who it was. We had to ask our friend who it was that they just hung. For the marquee moment in your show, you should make sure that the person you hang is someone everyone in the audience can identify. If you have to ask someone who they just hung, it really takes away from the impact of the final moments. If you enjoyed last year's show you'll most likely enjoy this year's show. But if you thought last year's show was just ok or was not good, you'll have the same opinion this year. In our opinion, just skip this show and go watch Elvira instead. In closing we'd like to say that 2017 looks to be one of the best year's at Knott's Scary Farm in a very long time. Overall the maze lineup is one of the strongest its been in years. Elvira is killing it as always and is not to be missed. The scare zones look to be on fire early this season. We have Halloween on the log ride again which is always a plus. Do not miss this year at Knott's. If you are going on a very busy night you might need to either pay the extra money for a Fright Lane pass or get there early for rope drop and hustle over to Trick or Treat. Our recommendation is to hit that maze first or Infected, then go to Dark Ride and Shadow Lands. Save Paranormal Inc. Toothfairy and Voodoo for the very end of the night or at least until after the 11:30 Elvira show. If you go with a plan and stick to your plan, you should be able to see everything in a night. One last thing we'd like to add, thank you to all the designers, especially Gus Krueger, Daniel Miller and Jon Cooke for all of your brilliant ideas year after year. Without you there would be no mazes to build. Thank you to the construction crew, paint department, props department and lighting. You are the reason the mazes come to life. Your hard work and long hours do not go unnoticed. To the brilliant makeup artists who help bring the characters of each maze and scare zones to life, thank you for all that you do night after night. Your makeups are some of the best in the business. To the line control and blackouts, know that you are truly appreciated. You have a hard job and don't get the recognition you deserve. Finally to all those people who get turned into monsters night after night, thank you so much for making Knott's Scary Farm so special and unique. You carry a legacy of this great event on your shoulders each and every night. There would be no event without all of you. The long hours and sleepless nights are tough and draining both mentally and physically. We know. We've been there on that side of the veil with you. We are tough on our reviews because we care about this event. We only want the best for Knott's Scary Farm. We want all guests to leave at the end of the night saying that Knott's Scary Farm is the best Halloween event in the world. Because it is. So go out there every night, give it your all and prove us right. Make Knott's Scary Farm the industry standard once again.